Vintage Or Antique Ceramic Half-doll Clothes Brush. Condition is Lovely with a little wear to the doll's dress. Dispatched with Royal Mail 2nd Class. The back casing is decorated in a delicious pattern of flowers blooming around a scallop shell, all contained in a beaded border. Charming and elegant all in one breath! marik mnnn A26 3209 3249. Length : 126mm. Weight: 27.1 g.
Truly a leap forward in performance for the professional stylist. DIANE #8118 _8-ROW 7" Extra firm boar bristle wood handle hair club brush. 100 percent natural boar bristle. Varnished gray wood handle. Lovely item in good order as the images show. It is very much in the Edwardian / Art Deco Style. The Hall mark date letter and assay marks are rubbed and the makers mark is readable. The central wooden section is loose and removable, this can easily be secured. 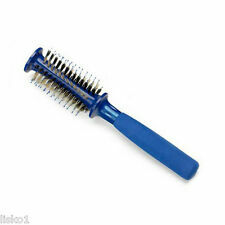 Hair Brush Manicare Radial Volumiser Easy Grip Round Barrel Professional Curling. Size : 22CM (long) Dia. with comb guards 43mm. Blow dry and style away with the Smooth Operator Round Hairbrush #3377 by Spornette. This antique hairbrush weighs approx. There is minimal wear present however there are no breaks or repairs. DIANE #8118 _8-ROW 7" Extra firm boar bristle wood handle hair club brush. 100 percent natural boar bristle. The brush handles are all ebonised Mahogany with settling silver inlaid crests, the bristles are hogs hair, very long lasting and strong. A complete nail set, scissors for the beard, hair, a bottle opener tweezers combe various grooming blades for beard detailing this case really has the lot. Mush Mush is proud to bring you our 100% natural OX Horn folding Beard and Moustache Comb, each comb is hand crafted from natural OX horn. Mush Mush OX Horn Folding Beard and Moustache Comb. Supplied in a Mush Mush Drawstring Cotton Gift Bag. Unicorn-Professional Hairdressing Barber Hair Cutting Thinning Scissors Set -6"
Daisy flowers and scrolls are beautifully detailed throughout the design, all in high relief. The brush is in excellent condition, with only a few dings along the edges. The bristles are all intact and in good condition. Narrow oval with red cushion. The Spornette Long Smooth Operator Tourmaline Ionic Bristle 3 1/2" Brush is an ouchless, one piece handle that. Narrow oval with white cushion, full size. It is very much in the Edwardian / Art Deco Style. The Hall mark date letter and assay marks are readable and the makers mark is rubbed. The central wooden section is loose and removable, this can easily be secured. Embossed finish with polished area in centre of brush for engraving. Assorted Colors. of cushion and to drain water out when brush is cleaned. NO Ball Tip Bristles. 7 Rows of Black Nylon Bristles set in a RED Cushion. Large oval with red cushion, full size. Also has the operator number card. DIANE #9705 STRAIGHTENING BRUSH TOURMALINE CERAMIC. DIANE TOURMALINE CERAMIC HAIR STRAIGHTENING BRUSH (#9705). NYLON BRISTLES. TOURMALINE CERAMIC PLATES HELP SMOOTH & STRAIGHTEN HAIR WITHOUT HEAT. The handle is polished hard wood Hollow Barrel Reduces Weight. Of tipped nylon for penetration and lift. The Spornette Porcupine Boar and Nylon Bristle Wooden. Length: 6 3/4in (17.2cm). -Weight: 4.67 troy oz (145.4g)(inclusive of the mirror). Pure bristle, Blonde wood handle - Oval cushion.